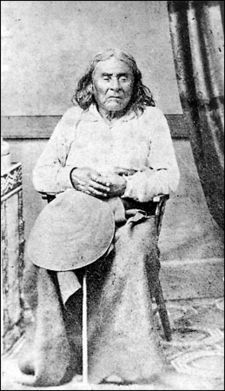 The only known photograph of Chief Seattle, taken ca 1865, when he would have been near the age of 80 years. Chief Seattle or Sealth (Lushootseed: siʔaɬ) (c. 1786 – June 7, 1866) was a leader of the Suquamish and Duwamish Native American tribes in what is now Washington state. A prominent figure among his people, he pursued a path of accommodation to white settlers, forming a personal relationship with David Swinson "Doc" Maynard. Maynard was an advocate of Native American rights whose friendship with Chief Seattle was important in the formation of the city of Seattle. When the first plats for the village were filed on May 23, 1853, due to Maynard's prompting, it was for the "Town of Seattle." While known as "Chief Seattle," there were in fact no hereditary chiefs among the Puget Sound tribes. From time to time leaders arose who distinguished themselves by their actions or particular skills, and were respected and followed. There were fishing leaders, peacetime leaders, and leaders in times of crisis. Beyond leadership skills and the gift of oratory, Chief Seattle had the desire for the two vastly different cultures to coexist in peace. He both observed and played a part in the birth of a small village named after him, that has since grown into a large metropolis known for its innovation, openness, diversity and love for creation. It is a remarkable legacy for a remarkable man. Chief Seattle was born around 1786 on or near Blake Island, Washington near present day Seattle. His father, Schweabe, was a leader of the Suquamish tribe of Agate Pass, between Bainbridge Island and the mainland of Washington state's Kitsap Peninsula across Puget Sound from the present city of Seattle. Seattle's mother was Sholitza (sometimes Wood-sho-lit-sa), the daughter of a Duwamish chief, from near the lower Green River area. As the line of descent traditionally ran through the mother, Seattle was considered Duwamish. Both the Suquamish and Duwamish are Coast Salish peoples. Seattle's given name at birth was Sealth. The exact year of Sealth's birth is not known, but he was believed to have been about 80 years old when he died on June 6, 1866. Sealth had reached his middle years before he appeared in the historic record. Information about his early years is fragmentary. Sealth reported that he was present when the British ship H.M.S. Discovery, captained by George Vancouver, anchored off Bainbridge Island on May 20, 1792. Chief Kitsap, war chief of the Suquamish and uncle of Sealth, was one of the most powerful chiefs on Puget Sound from 1790 to 1845. It is believed that Kitsap was one of the Indians who was welcomed aboard the Discovery, bringing his nephew with him. It is said that the visit so impressed the young boy that it had a positive effect on his future dealings with white settlers. Sealth took wives from the village of Tola'ltu just southeast of Duwamish Head on Elliott Bay (now part of West Seattle). His first, wife La-Dalia, died after bearing a daughter. He had three sons and four daughters with his second wife, Olahl The most famous of his children was his first, Kikisoblu or Princess Angeline. Around 1825, The Puget Sound Indians, not normally organized above the level of individual bands, formed a confederation under Kitsap to strike against the alliance of Cowichan-area tribes of southeast Vancouver Island, who often raided the Puget Sound. However, Kitsap's flotilla was no match for the larger canoes of the Cowichans; after suffering heavy losses in the sea battle, the Puget Sound Indians were forced to retreat. Kitsap was one of the few survivors of the ill-fated expedition. At the same time, Sealth succeeded in ambushing and destroying a party of raiders coming down the Green River in canoes from their strongholds in the Cascade foothills. His reputation grew stronger as he continued; attacking the Chemakum and the S'Klallam tribes living on the Olympic Peninsula, and participating in raids on the upper Snoqualmie River. Sealth eventually gained control of six local tribes. 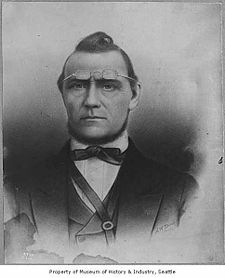 David Swinson "Doc" Maynard (c. 1868), whose friendship with Chief Seattle was important in the formation of the city of Seattle, and who advocated for the city to bear the chief's name. 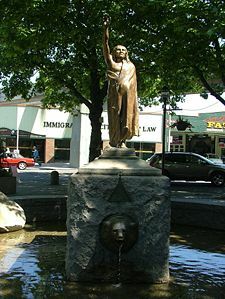 Statue of Chief Seattle, erected in 1908 at Tilikum Place, Seattle, Washington. The statue is on the National Register of Historic Places. By 1833, when the Hudson's Bay Company founded Fort Nisqually near the head of Puget Sound, Sealth had a solid reputation as an intelligent and formidable leader with a compelling voice.He was also known as an orator, and when he addressed an audience, his voice is said to have carried from his camp to the Stevens Hotel at First and Marion, a distance of three-quarters of a mile. He was tall and broad for a Puget Sound native at nearly six feet; Hudson's Bay Company traders gave him the nickname Le Gros (The Big One).. In 1847 Sealth helped lead the Suquamish in an attack upon the Chemakum stronghold of Tsetsibus, near Port Townsend, that effectively wiped out this rival group. The death of one of his sons during the raid affected him deeply, for not long after that he was baptized into the Roman Catholic Church, and given the baptismal name Noah. He is believed to have received his baptism by the Oblates of Mary Immaculate at their St. Joseph of Newmarket Mission, founded near the new settlement of Olympia in 1848. Sealth also had his children baptized and raised as Catholics.. This conversion was a turning point for Sealth and the Duwamish, as it marked the end of his fighting days and his emergence as leader known as a "friend to the whites." White settlers began arriving in the Puget Sound area in 1846, and in the area that later became the city of Seattle, in 1851. Sealth welcomed the settlers and sought out friendships with those with whom he could do business. His initial contact was with a San Francisco merchant, Charles Fay, with whom he organized a fishery on Elliott Bay in the summer of 1851.. When Fay returned to San Francisco, Chief Sealth moved south to Olympia. Here he took up with David S. "Doc" Maynard. Sealth helped protect the small band of settlers in what is now Seattle from attacks by other Indians. Because of his friendship and assistance, it was Maynard who advocated for naming the settlement "Seattle" after Chief Sealth. When the first plats for the village were filed on May 23, 1853, it was for the "Town of Seattle." Seattle was unique in its settlement in that a strong Native chief befriended the early settlers and sought to form a blended community of red and white peoples. While many influential whites attempted to keep their people separate from the native population, Sealth's friendship remained steadfast. Sealth served as native spokesman during the treaty council held at Point Elliott (later Mukilteo), from December 27, 1854, to January 9, 1855. While he voiced misgivings about ceding title to some 2.5 million acres of land, he understood the futility of opposing a force so much larger than his own people. In signing the treaty and retaining a reservation for the Suquamish but not for the Duwamish, he lost the support of the latter. This unhappiness soon led to the Yakima Indian War of 1855-1857. Sealth kept his people out of the Battle of Seattle (1856). Afterwards he unsuccessfully sought clemency for the war leader, Leschi. On the reservation, he attempted to curtail the influence of whiskey sellers and he interceded between the whites and the natives. Off the reservation, he participated in meetings to resolve native disputes. Sealth maintained his friendship with Maynard and cultivated new relationships with other settlers. He was unwilling to lead his tribe to the reservation established, since mixing Duwamish and Snohomish was likely to lead to bloodshed. Maynard persuaded the government of the necessity of allowing Sealth to remove to his father's longhouse on Agate Passage, 'Old Man House' or Tsu-suc-cub. Sealth frequented the town named after him, and had his photograph taken by E. M. Sammis in 1865. He died June 7, 1866, on the Suquamish reservation at Port Madison, Washington. Sealth's grave site is at the Suquamish Tribal Cemetery just behind St. Peter's Catholic Mission. It is on the Port Madison Indian Reservation in northern Kitsap County, Washington. In 1890, a group of Seattle pioneers led by Arthur Armstrong Denny set up a monument over his grave, with the inscription "SEATTLE Chief of the Suqamps and Allied Tribes, Died June 7, 1866. 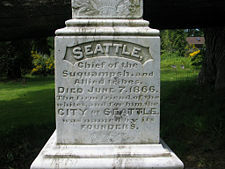 The Firm Friend of the Whites, and for Him the City of Seattle was Named by Its Founders" On the reverse is the inscription "Baptismal name, Noah Sealth, Age probably 80 years." The site was restored and a native sculpture added in 1976. The Suquamish Tribe honors Chief Seattle every third week in August at "Chief Seattle Days." The city of Seattle, and numerous related features, are named after Chief Sealth. Just before the Puget Sound area tribes lost their lands through treaties, Sealth had the opportunity to speak before a gathering in the presence of Governor Isaac Ingalls Stevens. The exact date and the location of the speech are disputed, but the most common version is that on March 11, 1854, Sealth gave a speech at a large outdoor gathering in Seattle. The meeting had been called by Governor Stevens to discuss the surrender or sale of native land to white settlers. Doc Maynard introduced Stevens, who then briefly explained his mission, which was already well understood by all present. It is recorded that Sealth then rose to speak, resting his hand upon the head of the much smaller Stevens, and declaimed with great dignity for an extended period. No one alive today knows what he said; he spoke in the Lushootseed language, his words were translated into the Chinook Native trade language, and a third person translated them into English. A young doctor present, Henry A. Smith, jotted down notes as the speech was being translated. More than 30 years later Smith's version appeared in print. It was a flowery text in which Sealth purportedly thanked the white people for their generosity, demanded that any treaty guarantee access to Native burial grounds, and made a contrast between the God of the white people and that of his own. Smith noted that he had recorded "…but a fragment of his [Sealth's] speech". In 1891, Frederick James Grant's History of Seattle, Washington reprinted Smith's version. In 1929, Clarence B. Bagley's History of King County, Washington reprinted Grant's version with some additions. In 1931, John M. Rich reprinted the Bagley version in Chief Seattle's Unanswered Challenge. In the 1960s, articles by William Arrowsmith and the growth of environmentalism revived interest in Sealth's speech. In the winter of 1971-1972, Ted Perry, a screenwriter working for the Southern Baptist Convention's Radio and Television Commission, used Chief Sealth's speech as a model for the script of a film on ecology, entitled "Home." The speech has been presented as an encounter between indigenous America and industrialized America, and has been widely cited as a "powerful, bittersweet plea for respect of Native American rights and environmental values". However, recent scholarship questions the authenticity of Smith's supposed translation. While no one knows exactly what Chief Sealth spoke that day, the words attributed to him have become world famous, a symbol of the conflicting values of cultures. ↑ 2.0 2.1 2.2 David M. Buerge, Chief Seattle and Chief Joseph: From Indians to Icons University of Washington Libraries. Retrieved December 17, 2008. ↑ The Suquamish Tribe. Chief Seattle's Gravesite Retrieved December 17, 2008. ↑ Jerry L. Clark, Spring, 1985. Thus Spoke Chief Seattle: The Story of An Undocumented Speech The National Archives. Retrieved December 17, 2008. ↑ Albert Furtwangler and Seattle. 1997. Answering Chief Seattle. (Seattle: University of Washington Press. ISBN 9780295976334), Online version books.google. Retrieved December 17, 2008. ↑ Walt Crowley, June 28, 1999, Chief Seattle's Speech HistoryLink. Retrieved December 17, 2008. ↑ BOLA Architecture & Planning. April 5, 2005. Port of Seattle North Bay Project DEIS: Historic and Cultural Resources Port of Seattle. Retrieved December 17, 2008. Buerge, David M. Chief Seattle and Chief Joseph: From Indians to Icons University of Washington Libraries. Retrieved December 17, 2008. Chief Seattle Arts. Noah Seattle Retrieved December 17, 2008. Denny, Emily Inez. (1909) reprinted 1984. Blazing the Way: True stories, songs and sketches of Puget Sound and other pioneers. Seattle Historical Society. Furtwangler, Albert, and Seattle. 1997. Answering Chief Seattle. Seattle: University of Washington Press. ISBN 9780295976334 Online version Retrieved December 17, 2008. Morgan, Murray. 1982. Skid road: an informal portrait of Seattle. Seattle: University of Washington Press. ISBN 0295958464. Speidel, William C. 1978. Doc Maynard: the man who invented Seattle. Seattle: Nettle Creek Pub. Co. ISBN 0914890026. This page was last modified on 23 December 2008, at 23:39.